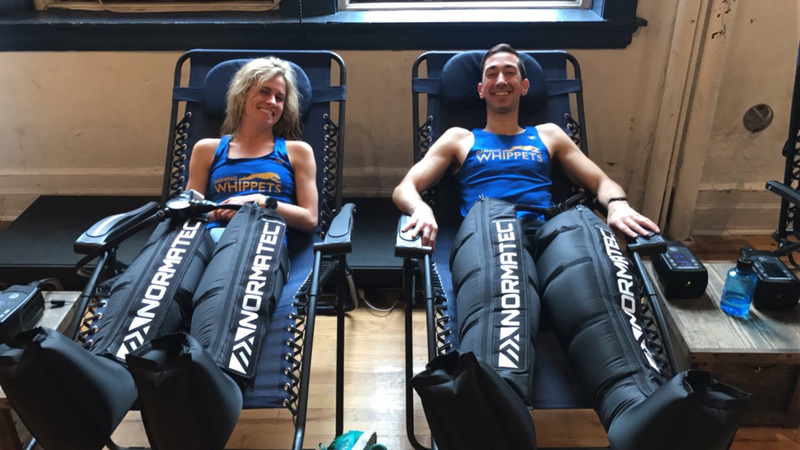 The NormaTec compression sleeves are one of the best tools for increasing circulation, decreasing inflammation and soreness, and enhancing recovery in just minutes. The Compression Sleeves use a unique massage pattern to provide dynamic compression to the limbs, thereby enhancing blood flow and the movement of fluids that hydrate muscle and tissue, giving you a competitive edge and leaving your legs feeling restored and ready to go. For more details on how the Compression Sleeves work, check out the NormaTec website. When should you use compression? The sleeves are particularly beneficial after a long run, intense workout, a race, or just when your legs are feeling tired and could use some recovery!